Susan Rosenbaum, with collaborators Suzanne Churchill (Davidson College) and Linda Kinnahan (Duquesne University), received a 2017 NEH Digital Humanities Advancement Grant to develop a work of Digital Humanities scholarship that charts the career of the twentieth-century writer and artist Mina Loy. 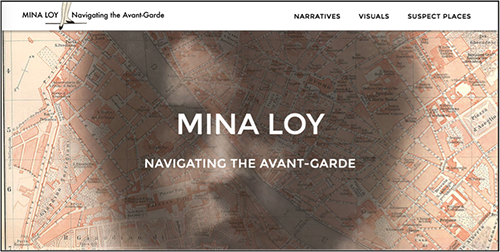 Mina Loy: Navigating the Avant-Garde (mina-loy.com) involves students, staff, and faculty at the three institutions, as well as designers and an advisory board comprised of modernist Digital Humanities specialists, Mina Loy scholars, and Project Consultant Roger Conover (Executive Editor of MIT Press and Mina Loy's Literary Executor). Artist, poet, playwright, actress, novelist, inventor, and entrepreneur, Mina Loy (1882-1966) participated in a number of avant-garde movements (Futurism, Cubism, Dada, and Surrealism); worked across literary genres and artistic media; and lived variously in Paris, Florence, Rome, New York, Buenos Aires, London, and Berlin from the 1910s to the 1950s. Her experimental writing, typified by radically new uses of language, typography, and page space, garnered attention for its bold feminism and innovative forms, often activated by encounters with visual culture. Although Loy played a leading role in the historical avant-garde, she has been relegated to minor parts in its histories and theories. Inspired by Loy’s innovative uses of verbal and visual design, Mina Loy: Navigating the Avant-Garde documents Loy’s avant-garde affiliations and pursues new modes of scholarship to invite a closer, more informed engagement with her work. Conventional print scholarship cannot accommodate the mixture of text, visual art, film, performance, and sound that brings Loy’s work and career to vivid life. The project uses open-access digital tools to analyze Loy's multi-disciplinary work, to challenge conventional formulations of the avant-garde that have excluded women and people of color, and to transform humanities scholarship by involving undergraduates and graduate students as equal partners. Students at all three institutions are contributing scholarly projects to the website. Jessica Riley (BA English, 2017) created a timeline of Loy's New York years for a CURO project, and Ph.D. students Jacqueline Kari (Creative Writing), Alex Edwards (English) and Erin McClenathan (Art History) will contribute original projects in Summer 2018. Research Assistants and Creative Writing Ph.D. students Amy Bonaffons and Genevieve Guzmán have also contributed original scholarship. In Fall 2017, Dr. Rosenbaum taught English 4790 "Networked Modernisms: Mina Loy and the Trans-Atlantic Avant-Garde," a course that featured a cross-institutional digital humanities project. The “Biography Project" involved students at Davidson, Duquesne, and UGA in researching and writing short biographies of figures associated with the avant-garde who were connected to Loy. Each class followed a shared template for the biographies and involved students in peer-reviews of at least two biographies authored by students from other schools. In workshops conducted by digital librarians at each school, students learned to gather and "clean" data from their biographical research. Pooling their data, the three classes were able to create visualizations of Loy’s social/artistic networks in Florence, New York, and Paris and to consider what these networks reveal about Loy and the avant-garde. This cross-institutional project will continue in Fall 2018, and the student-authored biographies and visualizations will be featured on the platform. Emily McGinn, Director of UGA's DigiLab, has created a preliminary visualization of Loy's social-artistic networks using cytoscape (the data is not yet complete). The platform is scheduled for completion in March 2019 and will be housed at the DigiLab in the UGA Libraries. The Willson Center's Interdisciplinary Modernisms Workshop, co-directed by Dr. Rosenbaum and Dr. Nell Andrew in Art history, has been central to the project's planning and development. You can follow the project's news here. The newsletter of the English Department: keeping you updated about faculty, alumni, and students' achievements. And follow us on Facebook, Twitter, and Instagram.